*The Geisha and the venue on the photo are a representation of what the event may look like. Geisha are well-known to the world as a symbol of Japanese culture. 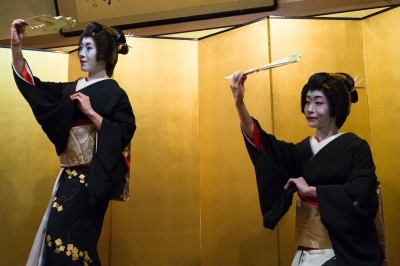 They are skilled entertainers who bring joy to banquets through traditional Japanese performance arts such as song, dance and "shamisen" (long three stringed Japanese guitar played with a pick). However, even in Japan, Japanese people hardly have an opportunity to meet with real Geisha. Therefore, together with the principal of Bando Private School (a kimono school managed by Geisha in active service), we have planned a party where everyone can casually communicate with Geisha in Asakusa. The venue is "CAFE & BAR Suzuro" near Kaminarimon Gate of Sensoji Temple. It features a stylish and modern crimson Japanese interior. Don't miss this golden opportunity! We look forward to seeing you at the event! *The Geisha and the venue on the cover photo are a representation of what the event March look like. * All of the following dates are Japan Time (UTC + 9). We will let you know by March 7, 2016 (Mon) if the party won't be held!! Purchase a ticket on Peatix and present your ticket at the venue on the day of the event. You need to purchase the ticket at the following site for participation. - We manage a website called “Ambassadors Japan” where goodwill ambassadors living in Japan introduce the attractions of Japan to you. We teach women how to properly wear a kimono to further enhance their feminine beauty. All classes are taught by Geisha in active service.